Encyclopedia of Hinduism, Second Edition examines the living faith of this religion and its historical and social background. 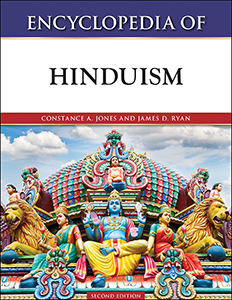 Aimed at the high school and junior college student as well as the layperson, this accessible reference explores the vast world of Hinduism, which emerged from prehistory and lives today in astonishing variety. With more than 700 A-to-Z entries, Encyclopedia of Hinduism, Second Edition focuses on the most significant groups within this religion, noteworthy teachers and their contributions, the religions and cultural movements that enriched its history, and the diaspora of Hindu thought and practice around the world. Two major religious traditions that sprang from Hindu influence, Jainism and Sikhism, also have many entries. A comprehensive introduction that provides an overview of the tradition, a chronology, a bibliography, and photographs complete this volume. Constance A. Jones, Ph.D., is professor at the California Institute of Integral Studies in San Francisco. She holds a Ph.D. in sociology, has published numerous articles on religious studies, and was a Fulbright scholar in India. She is also the author of The Legacy of G.I. Gurdjieff, as well as editor of Scholarly Perspectives on the Movement of Spiritual Inner Awareness. Currently, she serves on the Board of Directors of the Institute for the Study of American Religion, Santa Barbara, California, and Waco, Texas; is an active member of CESNUR, Association for the Study of New Religions, Torino, Italy; and is a member of the International Advisory Board for "The Complete Teachings of J. Krishnamurti, 1910–1986." James D. Ryan, Ph.D., is former director of Asian and Comparative Studies at the California Institute of Integral Studies in San Francisco. He earned a Ph.D. in Tamil literature at the University of California, Berkeley, and has translated and annotated the medieval epic Civakacintamani by Tiruttakkatevar.